The Gold Coast Writers Festival is on 26-28 October, and I’m heading off on the 25th on the long drive down. There’s a fabulous line-up of authors, publishers, and industry professionals all sharing their expertise with aspiring writers as well as giving readers insights into the industry. The panels at the festival are free, with seminars and workshops costing a minimal fee. It’s going to be a great event and I hope both writers and readers take advantage of the hard work the Gold Coast Writers Association has put in to bring this fantastic opportunity to the Gold Coast. 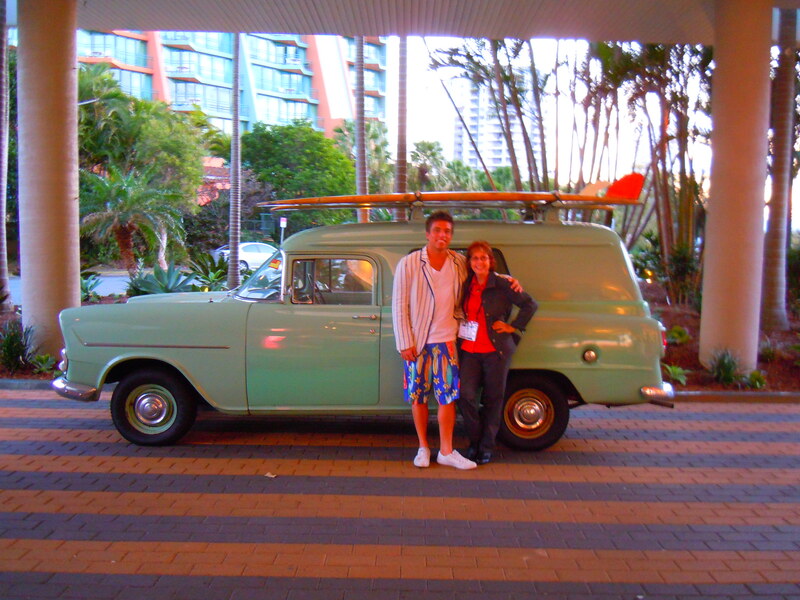 I know the Romance Writers of Australia national conference took place in August and it’s now October, but my friend Jacque Duffy has just sent me a photo she took of me with the gorgeous bellhop and the fabulous shaggin’ wagon … ooops, I mean panelvan, that was parked in the entrance to the QT Hotel at the Gold Coast where the conference was held.